A bat mitzvah is a special event in a young girl's life, and these bat mitzvah party ideas can help ensure everyone has a day to remember. The only rule when it comes to planning a bat mitzvah party is make sure it is an event the honoree enjoys, so let your daughter's personality shine through in the theme you pick for the big day. 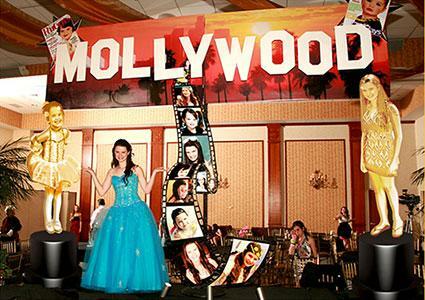 If your daughter is a big movie fan, then a Hollywood-themed bat mitzvah celebration can make a great choice. There are numerous ways you can approach this idea: you can build the theme around a favorite movie, focus on a specific genre of movies, go for old Hollywood-style glamour, or you can opt for a more general Hollywood theme. Print the invitation details on card stock that has images of some of the old greats printed in the background. Keep it simple with black and white Hollywood representing the town back in the days. Use the Hollywood sign in white printed on black card stock. Once you've created the invite graphics, print the details for the party and the party verse in white ink on the card stock. Slide the invitations into a black envelope with white inked addressing. Sprinkle in some confetti shaped like old movie cameras. Entrance - Drape a black and white striped curtain over the door to the entrance of the party. Roll a red carpet up to the doorway and use stanchions on either side of the red carpet to keep the "paparazzi" and "fans" off the red carpet. Tables - Drape party tables with black and white cloth linens. Place a tall and thin vase in the center of each table. Fill each vase with plumes of white feathers so it looks similar to a tree made out of feathers. At the bottom of the vase, place lit white LED votive candles. Walls - In the back of the room, in the center, put up a replica of the Hollywood sign. Have the DJ or lighting company shine lights on it so that it looks like the lit-up Hollywood sign in real life. Lounge area - Rent and place big, plush leather couches and chairs, along with a coffee table. You can also include plush, red velvet high-backed chairs as accents. Since most bat mitzvahs center around the party girl, you can also incorporate professional photos of the bat mitzvah girl as part of the décor. Create huge filmstrips that include pictures of the bat mitzvah girl from previous photo shoots. Hang the strip of pictures on the wall or from the ceiling. Have a life-size standup made of the honored girl as decoration and so people can pose with it for pictures. Paste the bat mitzvah girl's face on the bodies of famous actresses from old Hollywood and hang these around the room. Have waiters dressed in tuxes circulating the room with appetizers like finger sandwiches, chicken skewers, and mini beef Wellingtons. For a sit-down served meal, you can give your guests main dish options for chicken, beef, or fish. You can also choose to serve a combination of these foods to each guest. You can set up snack or sweets tables around the room, so guests can help themselves. Serve black and white cookies. Fill clear vases with licorices coated in black and white shells. Fill dishes with black and red gumballs. Fill jars with black and white lollipops. Add platters of strawberries with a yogurt dipping sauce. Fill bowls with cherry tomatoes and include a ranch dipping sauce on the side. Sliced red peppers can also include ranch dip. Stage paparazzi outside with flashing cameras to photograph guests as they arrive. It can be the photographer you've hired for the party, along with some "extras" to give the party the look and feel of old Hollywood. Print lines from old movies onto white cards. On the back, print the name of the actor or actress that said it, the character they played, and the name of the movie. Have the kids take turns guessing the movie, the actress, and the character. Instead of using vintage movies, you can use modern movies to make it easier for the kids to guess. Fill white favor boxes with black and white goodies. Wrap the boxes in film strip ribbon and tie into a bow. Provide a long and tall frame for photo strips. Pre-print with the girl's name, the theme of the party, and the date. Guests can slide their phots from the photo booth inside to display at home later. Place a mini Oscar statue or clapboard key chain at each place setting. Give your party guests the chance to let out their inner music star with either a karaoke or American Idol-themed event. Turn a CD and CD case into an invitation. Print the party details on a piece of card stock that fits inside of the CD case. Put the party details in a format so that it looks like the cover of the CD. Position it so the party details show through the case. You can also create your party invitations to look like the stickers that American Idol contestants wear when they are auditioning for the show. Create tickets or backstage passes. Print the party details on the tickets or backstage passes. Hang silver tinsel curtains behind the stage. This can also act as a cover to hide the backstage area where performers can enter. Hang a huge cutout of a microphone, the honored girl, or a sign with the American Idol logo on it. Attach the cutout to the silver curtain in the middle of the stage. Frame the front of the stage and the back wall of the stage with strings of white Christmas lights. Hang a disco ball from the ceiling over the stage. Set a microphone and a stand on the stage. Typically, a microphone comes with the karaoke machine you can rent or buy. 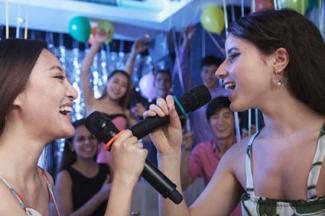 You can also choose to hire a karaoke DJ to act as the master of ceremony and to run the equipment. Rent or buy a fog machine so it creates a smoky look and feel as if the guests are in a nightclub. Instead of, or in addition to a fog machine, you can also use a bubble machine. Point a spotlight at the stage. You can also use a bright light or lamp instead of a spotlight. If it is an American Idol theme, set up a table near the stage for the "judges," who might be immediate family members or special guests. Add drinking mugs at each judge's space. Cover the party tables with bright blue and silver table covers, which are the colors of American Idol. Rockin' and rollin' is the main attraction at this type of bat mitzvah, so you can keep the party foods simple. Have bowls of snack foods, such as nuts, pretzels, popcorn, and chips on table in the room. Platters of hummus and pita bread, cheese and crackers, finger sandwiches, chips and dip, and veggies and dip are also appropriate. Cut the sandwiches with a star cookie cutter to stick with the "star" theme of American Idol. You can choose to serve a main meal buffet style or as a served, sit-down meal. Pasta dishes or meat dishes with sides work well for either option. Karaoke machines can be rented from most party supply stores, and you can download karaoke music from the Internet. You can simply let everyone sing away, or you can have an Idol-style competition with a few different rounds. Remember to have a prize on hand for the winning performer. Alternatively, or in addition to, the traditional karaoke, have a song writing contest. Give guests the chance to show off their song writing skills. Separate guests into groups and assign them a song title (a famous song that they know). Give them 30 minutes to write their own lyrics to the song that honors the bat mitzvah girl and then have them perform it on stage. G ive each guest an autograph book. The kids can go around to other guests at the party and have them sign their books. Burn a CD of your daughter's favorite songs. Create a cover with your daug hter's face or with the American Idol logo. On the back cover, list out each song on the CD and the artist. Arrange the party around her favorite sport, be it soccer, basketball, volleyball, or whatever else she might be into. Create an invitation that resembles the ticket to a sporting event. Include the party details on the ticket. Put a picture of your daughter on it in her sport's uniform or superimpose her head on a famous player's body. Slide the ticket into an envelope and mail it to recipients. Create an invitation that is the shape of the ball or equipment used in your daughter's favorite sport. For example, if she plays basketball, create invitations that look like a basketball. You can also write the party details directly on a baseball bat or soccer ball that you hand deliver to invited guests. Find an inflatable ball that represents the sport, such as soccer ball. Use a magic marker to write the party details on the deflated ball. Place the deflated ball in a box or padded envelope with an instruction card for the recipient to blow up the ball when they receive it, so they can see the party details. Turn the party room into a replica of the field or location where the sport is played. If your daughter's favorite sport is soccer, then turn the room into a soccer field. Place a goal at each end of the room. Cover the floor in between the goals with fake grass carpet to make it look like the field. Drop groups of soccer balls around the room. Frame and hang soccer jerseys from famous soccer players or your daughter around the perimeter of the room. Rent spectator stands from a local school gym or an event rental company. Set them up on each side of the field for guests to hang out. You can follow a similar concept for basketball, baseball, gymnastics, or any other sport. Buy ballons online or from your local party supply store that are shaped like the ball or something from the sport. Use one or two of these Mylar balloons as the center point and fill in with latex balloons that are the same color or complementary colors to the ball or sports equipment. Tie to a weight, such as a soccer ball maraca to use as a centerpiece. Serve foods you can find at a typical sporting event. Hire food carts, stands, or vendors to serve the foods to guests. Offer a (Kosher) hot dog cart, a root beer vendor, hot pretzels, popcorn, hamburgers, and French fries. You can also serve up some sweet treats that stick with the theme. Purchase cake pops from your local bakery. 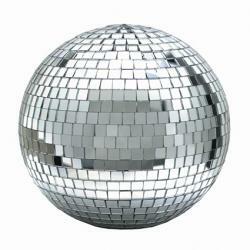 Have them made in the shape of the ball that fits the theme of the party, such as soccer balls. Serve cake that is also in the shape and design of the ball or item from the sport. For example, have a soccer ball cake for a soccer ball party or a hockey puck for a hockey party. Purchase a life size standup of male and female soccer player (or whatever sport you're representing). Have a photographer snap shots of each party guest posing behind the standup so that their face is on the player's body. You can also use a referee standup instead. Set up a mini sports challenge. Have the children remove their dress shoes (maybe even advise them to bring a pair of sneakers when you send out the party invitations). Have them kick a soccer ball into a net, throw a basketball into a hoop, or perform some sort of sports challenge in an allotted time. See who makes the goals and give them a prize. Personalized sports water bottles make great party favors for any sports-themed party. You can personalize the sports bottles with your daughter's name, party theme, and party date. Have specialty cookies made from your local bakery. Have them create shapes of the sporting equipment that represents your daughter's sport. Wrap in clear cellophane and tie off with a personalized ribbon printed with your daughter's name and the date of her party. Kick up your boots with an old west theme for the night. Use a "Wanted Poster" as the theme for your party invitation. You can put a picture of your daughter as the "Wanted" person. You can also use a shaped invitation, such as a pistol, shotgun, cowboy hat, or cowboy boots to print the party details. Print the party details on a plain white card stock. Slide inside of a red bandana and slip into an envelope to mail. Use live cactus as a centerpiece. 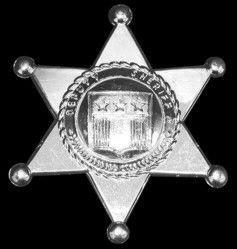 Place a fake Sheriff's badge at each place setting. See if you can borrow one or more real horse saddles or those from a local horse stable. Place the saddle or saddles on top of some bales of hay. Find or make "Wanted" posters and hang them around them room. Hang a chuck wagon sign near the food area. Hang western-themed danglers from the ceiling. Hang cactus light strands around the room. Make a huge banner sign to hang over the door that says, "Welcome to (Insert Daughter's Name)'s OK Corral." You can have it custom printed or make it with cardboard and markers or paint. Serve hamburgers, (Kosher) hot dogs, baked beans, and corn on the cob. Add a biscuit on the side. You can cut the biscuits into a shape, such as a horseshoe, cactus, or cowboy boot using a cookie cutter. Cut the biscuit dough with the cookie cutters before baking. Dessert can be a shaped cake like a horseshoe or cowboy hat. Add some cowboy cookies to round out the dessert area. Hire a photographer that has old west backgrounds and sets. 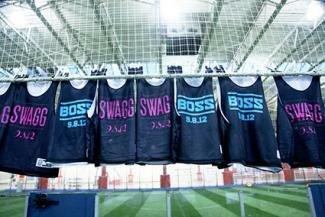 You can also purchase these from a backdrop company. Provide costumes and props from the old west. Have the kids pose with their friends dressed in costumes, holding parasols and play pistols or shotguns. Send the kids home with copies of the pictures as party mementos. Play old western movies on a big screen in the background or on a blank wall. You can choose a John Wayne classic or go with a more modern western that the kids are familiar with watching. Buy cowboy hats by the dozen, from local or online party supply companies. Hand the hats out as guests arrive, so they can wear them at the party and take them home to wear again later. Place cowboy boot bubble in baskets or at each place settings. Guests can blow bubbles during the party, on the dance floor (but be careful because it can get slippery), or take them home to blow outside later. Bring the city of light to life. Create invitations that look like the boarding pass for the airplane. Print the party details on to it, inviting your guests to be whisked away to enjoy a night in Paris. Find postcards with scenes from Paris at night on the front. Print the party details for the party on the back. Mail to guests as is or slide into an envelope and then mail. Find small vintage bicycles. Attach a card stock with the party details to the bicycle with a ribbon. Place each bicycle in a small box or padded envelope before mailing off to guests. Rent a ballroom with chandeliers or rent chandeliers from a local party store. Hang the chandeliers from the ceiling over each table or throughout the room. Tables - Cover the tables with alternating black and white table covers. You can add red linen napkins to each place setting as an accent color. Centerpieces - Place a small lamp in the middle of each table. Pick one with a Parisian shade to fit with the theme. Walls - Frame posters or find picture or paintings of famous French landmarks, such as the Eiffel Tower and the Arc de Triumph. Hang them around the room. Strategically place old vintage bicycles propped up around the room, especially on old lamp post replicas. For an alternative centerpiece that can also double as a dessert or favor option, work with a bakery to make mini cakes decorated in a black and white Parisian theme. Place them on wire or white cake stands with fringe and beads hanging off the sides. Place one cake on each cake plate and put one in the center of each table. Surround it with white votive candles in crystal votive candle holders. Main dishes - Serve main dish crepes. You can hire a crepe maker so people can choose their style. Chicken, spinach, and cheese is one option. Dessert crepes are another fun option, such as Nutella and strawberries. Quiche and souffles are also great main dish meals. Sides - Serve French foods that the kids will like. While it might not be French, serve up some French fries as a side dish since kids tend to like them. Piles of croissants can be served in bread baskets at each table. You can also serve chocolate croissants as a dessert. Dessert - Work with a bakery to make a bat mitzvah cake in the shape of the Eiffel Tower. Have them add a sign with your daughter's name or Paris made out of frosting. 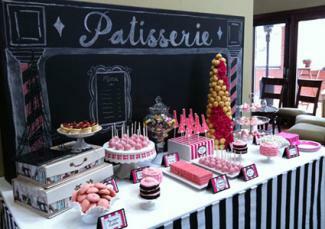 Fill a table with French pastries, such as macaroons, mini fruit tarts, and eclairs. Hire strolling jazz musicians to walk through the party, playing at certain times. Play a French music CD in the background in between the strolling band. Play movies that relate to Paris, such as French Kiss, An American in Paris, The Aristocrats and Ratatouille. Have cookies made in the shape of the Eiffel Tower. Have them frosted in black and white. Wrap in cellophane and tie off with a black or white ribbon. Place at each setting or fill baskets with the cookies for guests to enjoy or take home with them. When you're coming up with your bat mitzvah celebration ideas, don't forget to keep your party planning basics in mind. Plan the event with your guest list in mind. For instance, if the party includes younger kids, you'll need some activities to keep them entertained, and if adults are going to be sticking around for the fun, you'll need a space for them to sit down and chat. Planning the party around your guests will make the whole event easier and more enjoyable for you and your daughter.